Shown are Rotary members Phillip Sparacella, Gerald Stasicha, MVH's Director of Fund Development Melissa Marion, Ron Vivio, Beverly Belczyk and Robert Kopko. 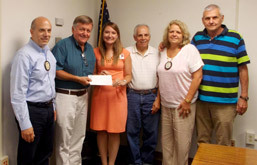 Members of the Monessen/Rostraver Rotary donated $1,000 to become a Rose Gold Sponsor of the Monongahela Valley Hospital/Lois Orange Ducoeur Breast Cancer Walk. The walk will be held at the Charleroi Market House, 423 McKean Ave., on Saturday, Oct. 11, at 10 a.m. Registration begins at 9 a.m. and the suggested donation to participate is $10 for those age 7 and older. Shown are Rotary members Phillip Sparacella, Gerald Stasicha, MVH's Director of Fund Development Melissa Marion, Ron Vivio, Beverly Belczyk and Robert Kopko. Rotary members are also forming a team to participate in the walk. Other major sponsors include the Colgan Insurance Agency, MarBill Diamonds & Jewelry and The Valley Independent/Trib Total Media. For information about the walk, call MVH's Office of Fund Development at 724-258-1855.